AVAILABLE Beginning July 1st 2011 - Book Now! This picturesque lakefront cottage is adjacent to the main house with a connecting trail that follows the lake around the point. The property is only accessible by boat. Boat rentals are available at Lakeside Marina or you can launch your own boat at any of the boat launches on the lakes. We recommend the county launch or the North Lake Resort for launching your own boat. 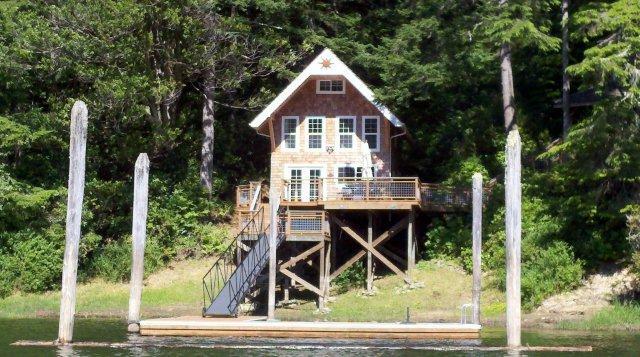 The Lakefront Cottage offers amazing views in a very private setting. These photos were taken during construction and will be updated once all work is complete. Please ignore the mess and know that the property will be perfect at completion. Due to liability constraints, the ski boat, sled boat and jet skis that belong to the property CAN NOT be used by renters. Boat and jet ski rentals are available at Lakeside Marina or you can bring your own equipment. Although we can not guarantee that your cell phone will work, cell coverage form the house is very good with most carriers. Sorry - no internet or land line service. Lakeside is located directly off the 101 - Oregon Coast Highway. 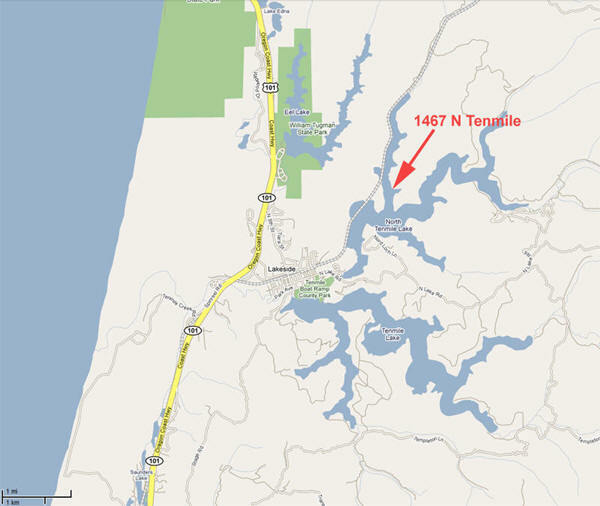 1467 N Tenmile is located on the North Lake - Blacks Arm as show in the location map below. You will need to orient yourself from your launch point on the lakes to find your way to the property.